While the vast majority of the automotive industry is worried about plateauing sales, this automaker will thrive regardless. Here's why. As the U.S. auto industry is notoriously cyclical and fickle, automakers understand that phrase better than anyone. 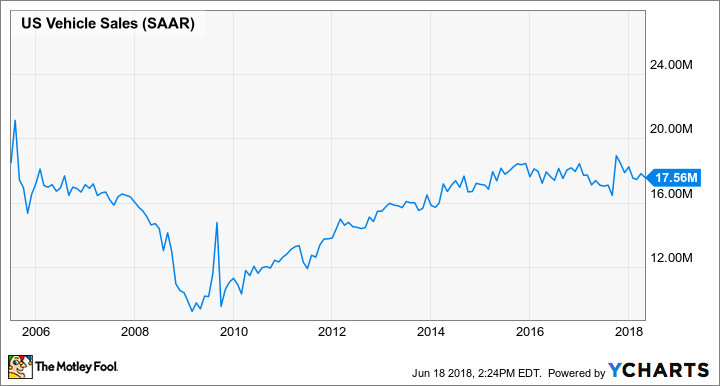 After enjoying a slow and steady rise in new-vehicle sales since the depths of the Great Recession, the U.S. market is now slowing, causing Wall Street to throw auto stocks like Ford Motor Company and General Motors to the curb. But investors should ignore that negative sentiment when it comes to Ferrari (NYSE:RACE). Here's why. US Vehicle Sales data by YCharts. The question above might sound ridiculous, but think of it this way: Is Ferrari closer to an automaker or luxury product manufacturer? 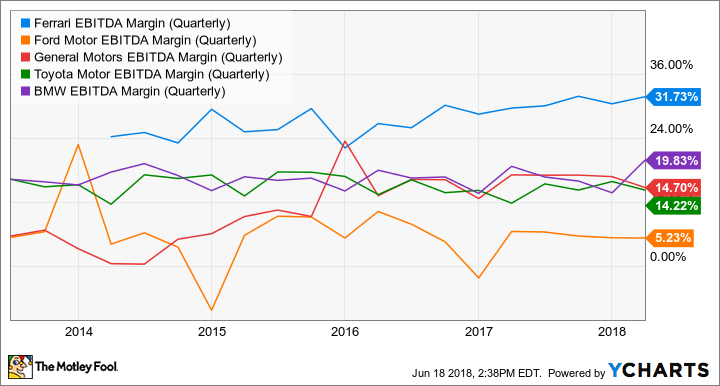 The answer is simple when you compare its EBITDA margin to those of mainstream automakers such as Ford, General Motors, and Toyota -- and even German luxury automaker BMW. RACE EBITDA Margin (Quarterly) data by YCharts. Ferrari has margins that make any company in the automotive industry drool, making it far closer to being a luxury product maker. If further proof is needed, compare Ferrari's price-to-earnings multiple to mainstream automakers. The ultra-premium carmaker trades at a staggering P/E ratio of 42, compared to Ford at 6 and Fiat Chrysler Automobiles -- which Ferrari was spun off from to unlock its full value -- at 7. Mainstream automakers will be hit hard when the U.S. new-vehicle market stalls and competition heats up, likely putting pressure on them to beef up incentives and deals to protect market share and support sales volume, which will eat away at profits. Ferrari should be able to maintain its margins because it's not demand-constrained -- it limits the number of vehicles it sells annually purposefully to protect its exclusive brand image as well as its price point. And it's worked: Ferrari has consistently posted incredible EBITDA margins throughout economic cycles. Ferrari GTC4Lusso. Image source: Ferrari. Now that we've established Ferrari plays by different rules than typical automakers, the remaining question is: Can it grow fast enough while limiting its sales? Its first-quarter growth was promising, and for the full year management is guiding for 9,000 shipments, up from the 8,398 in 2017, and it's aiming to double core earnings to $2.5 billion no later than 2022. That means investors can expect Ferrari to consistently, yet cautiously boost the sales ceiling to provide investors with profitable growth. No investment is without risk, and that includes the seemingly bulletproof Ferrari stock. One hesitation for some investors is simply that CEO Sergio Marchionne, who has done quite the job bringing Fiat Chrysler Automobiles back from the dead while spinning off Ferrari to unlock more value, is set to leave the company in 2021. Investors can bank that the company will put the reins in a capable candidate's hands with a well-considered transition plan, but that doesn't ensure a successful CEO swap. Chairman John Elkann, head of the Agnelli family, which controls Fiat Chrysler, has said the new CEO will be picked from Marchionne's closest executives. CFO Richard Palmer, Europe head Alfredo Altavilla, and Jeep chief Mike Hanley are thought to be high on the list. Another concern -- at least from a Ferrari purist standpoint -- is Ferrari's upcoming SUV. That's right, the ultra-premium race car brand is cashing in on the SUV craze. Marchionne confirmed at the 2018 Detroit Motor Show that the market could see a Ferrari SUV as soon as 2019, but that it would absolutely drive like a Ferrari product is expected to. Investors will have to wait and see if this was a brilliant move that could send sales surging with limited impact to its racing brand, or if the idea of selling out for SUVs ends up hurting the brand image, which is arguably the most important competitive advantage the company has. Despite minor concerns, the upside for Ferrari is that it is arguably the safest, yet most lucrative automotive stock there is. Ferrari sails through economic cycles smoothly and offers margins mainstream carmakers can only dream of. The downside? Because of those positive aspects, investors are paying a hefty premium at a price-to-earnings ratio of 42. Ferrari is a rare breed, indeed, and it's the one automotive stock likely to thrive as U.S. light-vehicle sales slow (and potentially begin to decline).